Type KK Air Filters - Airsan Corp.
Airsan Type KK filters are washable air filters used for furnace filtration and industrial cabinetry, military-spec computer housings, electrical systems and inverter ventilation. They are used with no adhesives, providing low initial resistance and large dust-holding capacity for greater overall efficiency. These filters are designed with polyester media between two pieces of screen cloth, metal frame and expanded metal on both faces for added protection. They are easily interchangeable with any disposable filter, and can be installed and serviced in less time than ordering, receiving, stocking and replacing the old filter. 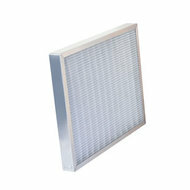 AIRSAN TYPE KK FILTERS ARE WASHABLE AIR FILTERS USED FOR FURNACE FILTRATION AND INDUSTRIAL CABINETRY, MILITARY- SPEC COMPUTER HOUSINGS, ELECTRICAL SYSTEMS AND INVERTER VENTILATION. TYPE KK FILTERS ARE USED WITH NO ADHESIVES, PROVIDING LOW INITIAL RESISTANCE AND LARGE DUST-HOLDING CAPACITY FOR GREATER OVERALL EFFICIENCY. KK FILTERS ARE DESIGNED WITH POLYESTER MEDIA BETWEEN TWO PIECES OF SCREEN CLOTH, METAL FRAME, AND EXPANDED METAL ON BOTH FACES FOR ADDED PROTECTION. TYPE KK FILTERS ARE EASILY INTERCHANGEABLE WITH ANY DISPOSABLE FILTER, AND CAN BE INSTALLED AND SERVICED IN LESS TIME THAN ORDERING, RECEIVING, STOCKING AND REPLACING THE OLD FILTER.